IBM Partnerworld program provides its business partners with right set of tools, resources, trainings and cost benefits to accelerate time to value and growth for clients. The program is focused on offering required support, guidance and rewards to IBM partners that help create innovative solutions by leveraging IBM products portfolio and resolve client’s toughest problems. IBM business partnership also provides access to Partnerworld University (PWU) offering education, demos, how-to guides, solution examples and trainings with personalized courses to help build required technical skills and capabilities to meet the evolving market needs. The program also offers advocacy and support benefits to its partners including technical support, IBM-negotiated rates and terms and conditions on IBM products, and third-party discounts from over 60 participating vendors to accelerate ROI and increase profitability for clients. Becoming IBM business partner is rewarding us for building and delivering the capabilities that our clients need. It truly supports our ability to create IBM ready solutions, services and integrations that drive business growth and client satisfaction. With a decade of experience in product engineering, cloud computing and IoT solutions implementation, our engineers help integrate and customize IBM solutions as per client requirements, efficiently respond to changes required, and create high quality systems faster; while controlling development costs and meeting compliance needs. Whether you’re creating an entirely new solution or integrating IBM solutions to one that exists, as an IBM partner we make it easier by having access to right configuration tools, support and trainings from IBM. 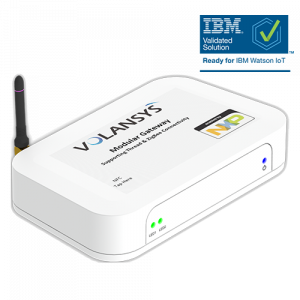 We enable OEMs and IoT service providers to architect robust and secure large node network (LNN) based IoT solutions using VOLANSYS modular IoT Gateway reference platform offering multiple wireless connectivity options to connect thousands of IoT edge devices and SDK based connectivity to IBM® Watson IoT Platform providing out-of-box and easy to customize product connectivity and control services, product maintenance services, product user/usage data services, and product interoperability services. To know more about IBM Ready Modular IoT Gateway Solution, please click here.